I have recently been following the progress of celeron55, xyz and sfan5 in the work towards an official mobile version of minetest. This is something I would really like to see and get involved with. Does anyone have any ideas why this might be? It seems like it worked ok on sailfish os and xyz's patches work fine with freeminer. I suspect it is probably something quite simple but I have no idea where to begin looking. Now available as a debug.apk for testing purposes only. Do not try to run this on anything you are not prepared to break! Ok the worst that should happen is that it just won't work but I can not promise anything. Please do not post things like: You broke my phone or it doesn't work. At very least tell me what happens and what version of android you are running. Please read all the previous replies before posting a question. Last edited by stu on Sun Mar 09, 2014 19:19, edited 1 time in total. Sorry, can't help you there. But if you manage to get it running, please force the player to select a name as a first step after starting the game. Else new players will wonder why there's no server that wants them (with automatic Guest1234 names beeing disallowed on almost all serious servers). Having an android version would be great! You need to somehow pass --disable-unittests to minetest, your LogCat output shows that it ran the unit tests and exited. Disabling the tests appears to have done the trick, however I could not find a way to pass command line args to a native android app, so instead I had to disable the tests using preprocessor directives for now. I am a little concerned as to why these tests cause the app to fail, they seem to pass ok with freeminer. Never the less I have it working now (of a fashion) clearly there is much work to be done before we can even think about an official release. Last edited by stu on Sun Jan 12, 2014 20:04, edited 1 time in total. You won't be able to figure out anything without using ndk-gdb, so do that. xyz wrote: You won't be able to figure out anything without using ndk-gdb, so do that. Do you happen to know if there is any way I can just reconfigure the ndk-gdb? stu wrote: Do you happen to know if there is any way I can just reconfigure the ndk-gdb? No, I didn't look into it at all. Last edited by stu on Tue Feb 11, 2014 23:17, edited 1 time in total. Great work stu! Would've tested this, but my phone's 386 MB RAM is not at all enough for MT. hoodedice wrote: Great work stu! Would've tested this, but my phone's 386 MB RAM is not at all enough for MT. Are you putting any optimizations for android? I don't think so. If you didn't, there is no way in hell anything with less than 1 GB of RAM can run it above 20 fps. BuildCraft lagged horribly on my device, and the textures never showed up either. hoodedice wrote: Are you putting any optimizations for android? I don't think so. If you didn't, there is no way in hell anything with less than 1 GB of RAM can run it above 20 fps. BuildCraft lagged horribly on my device, and the textures never showed up either. I take it the lower right hand button is the menu, and the middle button in the directions is to jump? also, does it have multi-touch support so you can sneak and move at the same time? oh, and do you have toggles for fly, no-clip, and fast? Novacain wrote: I take it the lower right hand button is the menu, and the middle button in the directions is to jump? also, does it have multi-touch support so you can sneak and move at the same time? oh, and do you have toggles for fly, no-clip, and fast? 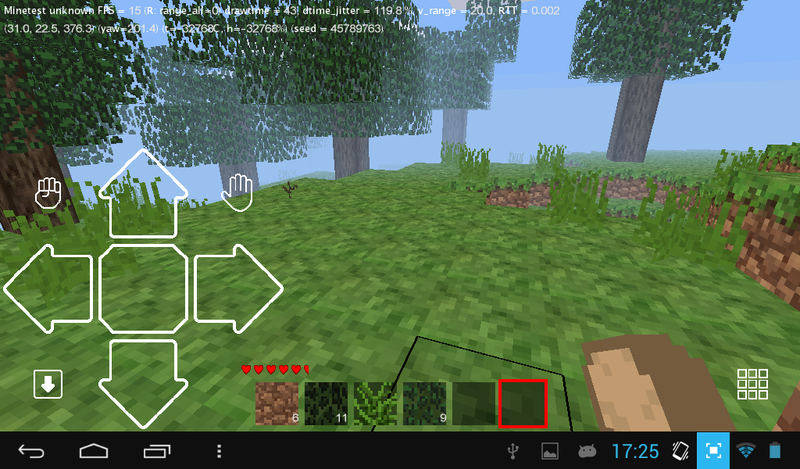 The lower right button shows the player inventory and craft grid, there is currently no way to return to the menu (at least the back button is not working on my device running JellyBean) The middle button is the jump key and multi-touch is supported. There are currently no buttons for fly, fast etc but could be easily added in future but with the current performance level and view range I do not see much point right now. Last edited by stu on Sun Jan 26, 2014 20:24, edited 1 time in total. Can I get the apk? Ok, lol, as you can see in the above posts, the android build is not ready yet. Please be patient as this might take some time. 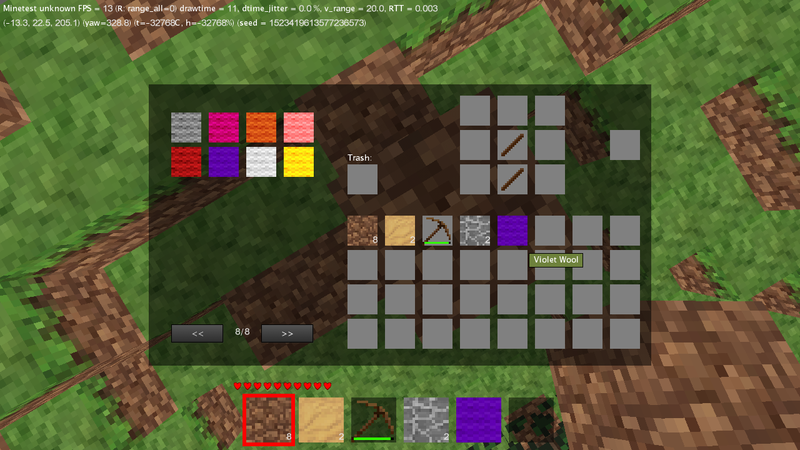 Added auto-extraction of minetest support files from jni assets directory. then you must delete this before launching the new apk. It is probably not a good idea to connect to public servers without the consent of the owner. Last edited by stu on Sun Feb 09, 2014 18:03, edited 1 time in total. stu wrote: Rebased and updated. then you should delete this before launching the new apk. It will be useless to test it on my phone, as it is both impossble and a hell lot of work to get MT to run on it. However, MCp runs nicely on my phone. Should I test MT? custom ROM, 1.2 GHz single core overclocked, 386 MB RAM, tweaked. hoodedice wrote: Should I test MT? If you have to ask this then the answer is no. I suspect you may be a bit low on RAM but then I have no idea of the requirements. One of the reasons I have released this is to find out where it works and where it does not. * android's virtual keyboard doesn't roll-out, so it's a bit hard playing when it's been used (like just after typing a new world's name). Restarting the app worked around it. * moving around is both fluid and easy. Except the occasional "micro-freeze" every ten seconds or so. I guess it's related to chunk generation, and it might be less noticeable when playing on a remote (and stronger) server. * overlaid keys work rather well, but could use some slight improvements. 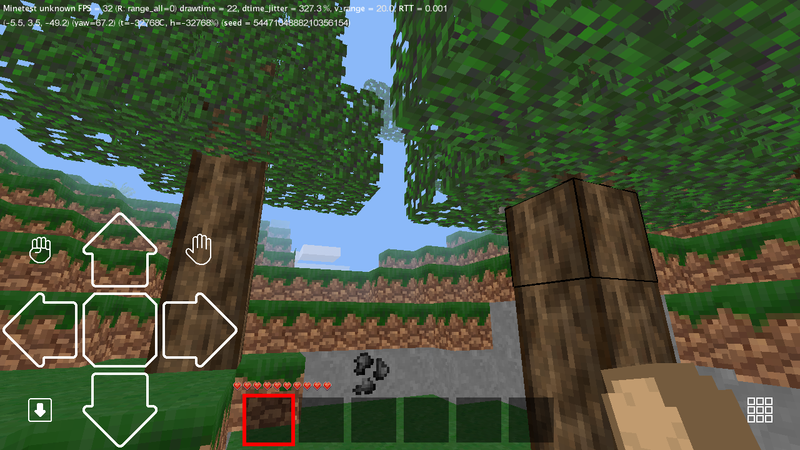 Especially moving jump (and probably other "non-directional" keys) on the right side of the screen, that may help a lot. * it's nice to be able to select blocks by clicking them. It would be even nicer if long-pressing them could mine them (much easier than a virtual button, if you ask me). For a first version, it's rather impressive. Congrats and thanks. I'll test it on a server as soon as possible, to see if it improves the experience. 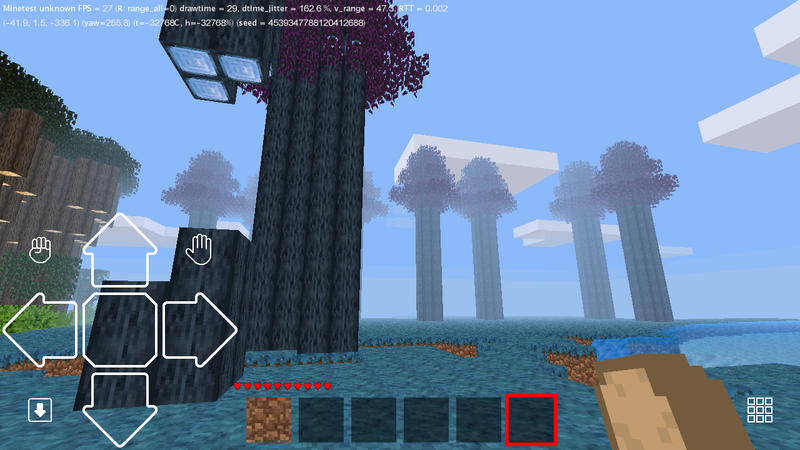 There are a few bugs (but that is to be expected) like the rendering distance fluctuates massively, sometimes it is 15 blocks, over times it is 40+... When you dig nodes, you sometimes have to press the dig button several times. I'm not sure what the purpose is of the little button with an arrow pointing down in the far bottom left corner is... As thetoon said, there is no way to exit the keyboard after creating a world, so you have to leave the app and come back to be able to play... As far as bugs go that is it as far as I can see, except that it sometimes will randomly freeze and quit. This is a much more playable game than either the Freeminer android app, or the Bulidcraft one... The controls are much more fluid, and all works well. Thank you for this great gift to the Minetest project! You have done a wonderful job of it! I must admit that when I first read the first post, I didn't think that you would manage it. Thank you again. The phone I tested it on was a Samsung Galaxy SII. Mobs out of the Lord of the Rings modpack. Last edited by Amaz on Mon Feb 10, 2014 11:01, edited 1 time in total. thetoon wrote: android's virtual keyboard doesn't roll-out, so it's a bit hard playing when it's been used (like just after typing a new world's name). Restarting the app worked around it. I added a patch that effectively disables the 'v' button because it causes the app to crash in android 4.1 and 4.2. I will add a more comprehensive fix asap. 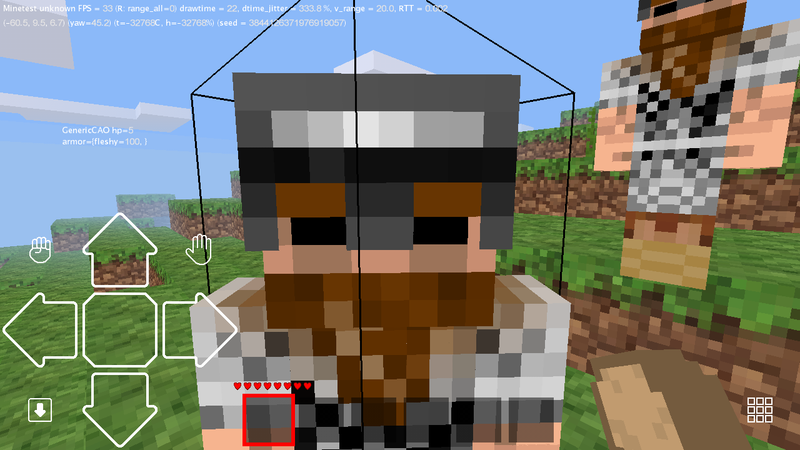 thetoon wrote: it's nice to be able to select blocks by clicking them. It would be even nicer if long-pressing them could mine them (much easier than a virtual button, if you ask me). That is how xyz originally wrote the touchscreen interface but I could not get away with it, I was digging things and placing things I didn't want to. Maybe it just needed some tweaking but I much prefer the idea of using action buttons anyway. The little down arrow is for sneak (or down if you are on ladders etc). I would like a better icon for this. Thank you both for your very encouraging feedback. Tried the debug apk on my little Xelio P1001A tablet (rooted). The install seemed to go okay, but it instantly crashes as soon as you tap the launcher icon. D/AudioHardware( 89): AudioHardware pcm playback is exiting standby. 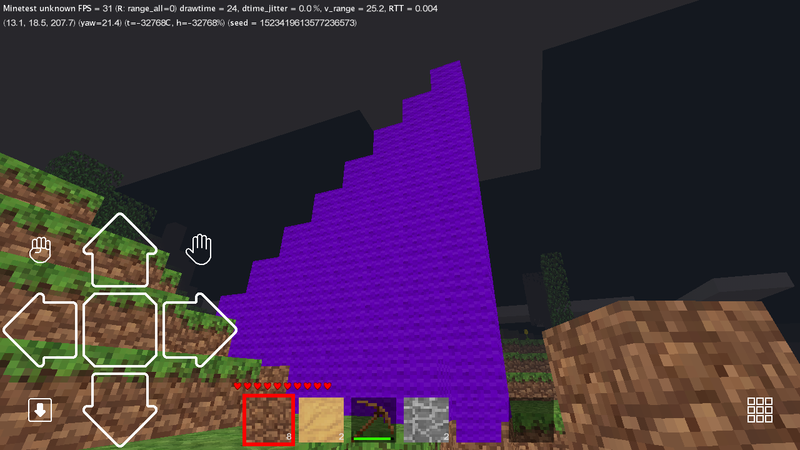 I/ActivityManager( 264): Process org.minetest (pid 1952) has died.